Steve uses a nineteenth century style treadle wheel which he built while working in the 1850s living history village of Westville, GA. The wheel was built mostly with traditional techniques, hand tools and salvaged materials. 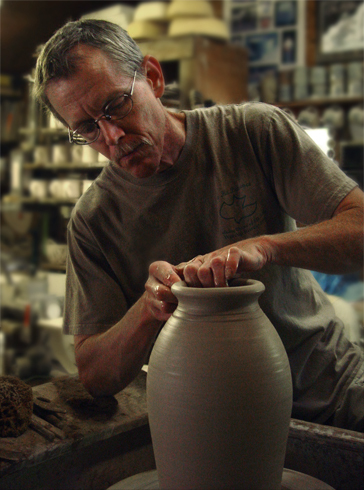 Each piece is individually made on the potter’s wheel or by other hand methods, glazed, decorated and fired to 2300º. While most of Elk Falls Pottery mugs and other small items are now made on an electric wheel, Steve still prefers the rhythm and silence of the treadle wheel. While Steve does most of the throwing, Jane primarily does handbuilding including a line of porcelain pins and earrings with quilt patterns. 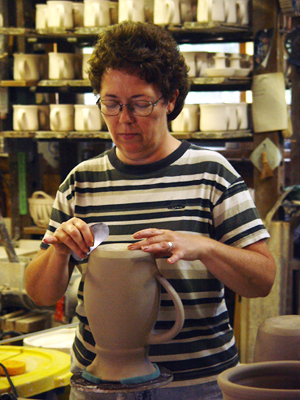 She also does most of the trimming, staining, glazing and loading of the kilns.